LIBERTY’S CRUSADE: Behind the attacks of the zerg and the protoss lies the story of a lifetime, and investigative reporter Mike Liberty is determined to uncover it. But every new piece of information only deepens the mystery. Thrown into the middle of a war that may determine the fate of humanity in the Koprulu sector, Liberty reports on the escalating conflict and wonders whom he can afford to trust. SHADOW OF THE XEL’NAGA: Bhekar Ro is a bleak, backwater world on the fringe of the Terran Dominion, and every day is a struggle to survive for the planet’s human colonists. Yet when a violent storm unearths an unfathomable alien structure, Bhekar Ro becomes the greatest prize in the Koprulu sector. 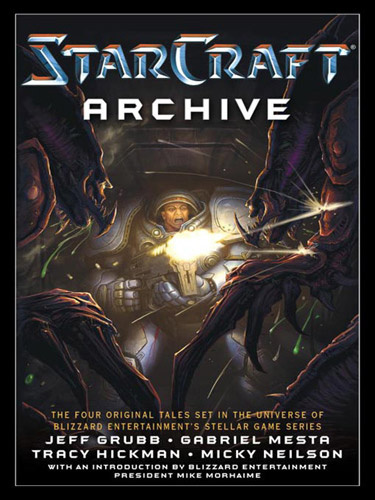 Zerg, protoss, and terran forces turn the planet into a bloody battlefield in their haste to claim the lost secrets of the most powerful species the universe has ever known. SPEED OF DARKNESS: All Ardo Melnikov ever dreamed of was living in peace on the verdant colony of Bountiful. That dream was shattered when the zerg attacked the colony and annihilated his loved ones. Now a marine charged with defending the worlds of the Terran Confederacy, he must come to terms with the painful memories of his past…and the unsettling truths that may dominate his future. UPRISING: She is the Queen of Blades. Her name has become legend throughout the galaxy, and that legend is death for all who dare oppose the swarm. Nevertheless, Sarah Kerrigan was once human, and an extraordinary human at that. Forced to become one of the Terran Confederacy’s merciless psionic assassins, she carried out her orders without question until a twist of fate propelled her toward a destiny no one could have foreseen. This is the tale of Kerrigan’s shadowy origins — and the war that was fought for her very soul.